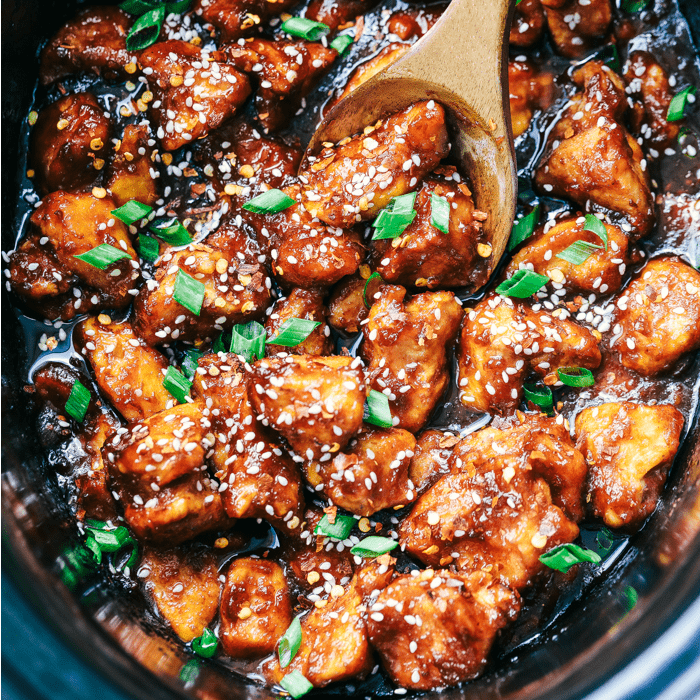 Slow Cooker General Tso’s Chicken is a super easy meal with an amazing sweet and savory sauce with a little bit of heat! This is way better than takeout! I made this recipe four years ago and the pictures weren’t doing it justice. 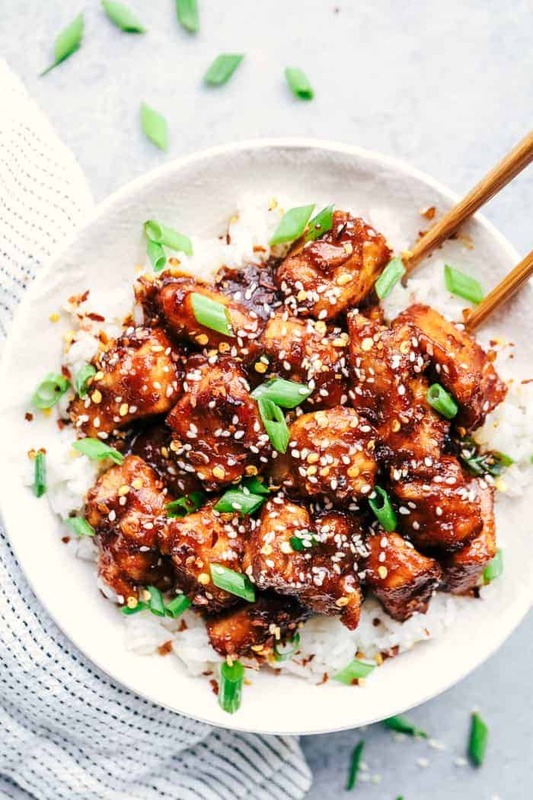 We love asian inspired meals here at our family so of course this was one of the first recipes to make its debut on the blog. We have it quite often at our house and it is incredible. I love being able to make better than takeout right at home! It was time to update the pictures on here and my family was reminded about how much we love it. Everyone devoured it including my youngest two year old. You start by adding a simple breading to the outside and pan frying the edges for just a few minutes. This is an extra step that of course you don’t have to do, but I love the crispy edge and tender and juicy center by doing that extra step. If you want to just dump the chicken in with the sauce and let it do its thing you can as well. The rich and dark sauce in this meal is incredible. It is sweet and savory with just a little bit of heat. I always have to hold out the red pepper flakes until the end just for my kiddos, but it has such incredible flavor. 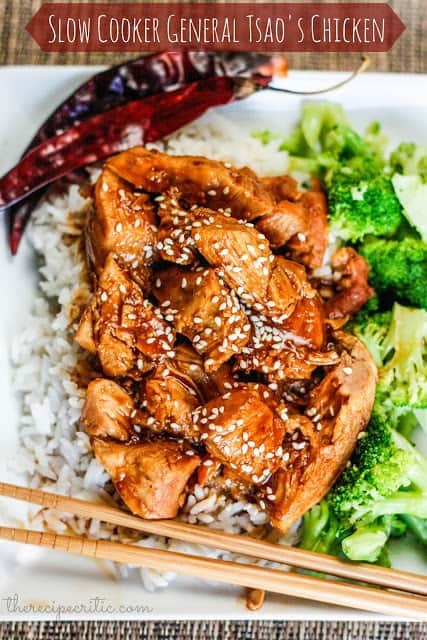 The sauce is thick on the chicken and it is perfect served over rice with some veggies. I know this is a meal that your family is going to love! You will make it again and again. 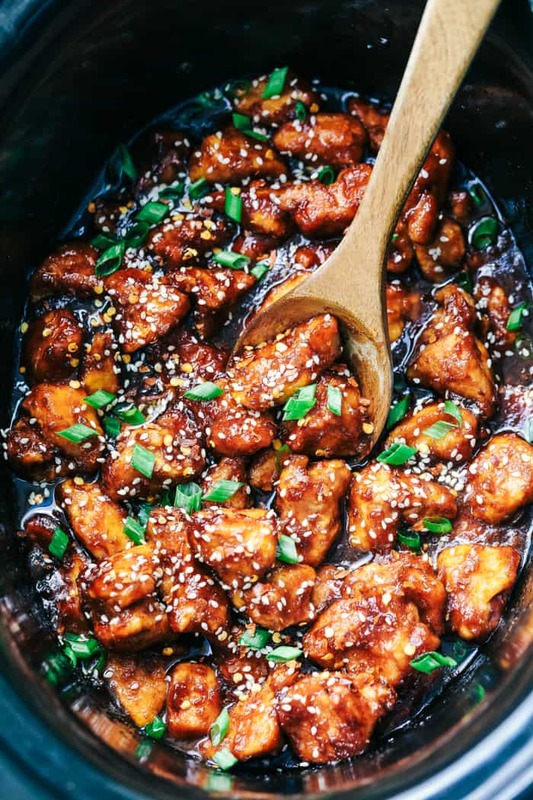 low Cooker General Tso's Chicken is a super easy meal with an amazing sweet and savory sauce with a little bit of heat! This is way better than takeout! In amixing bowl add the chicken and cornstarch. Toss until the chicken is completely coated in the cornstarch. In a medium sized skillet over medium high heat add oil and cook the chicken until the chicken is lightly brown but not cooked throughout. Put in the bottom of a slow cooker. I am so excited to try this out. Making it tomorrow. 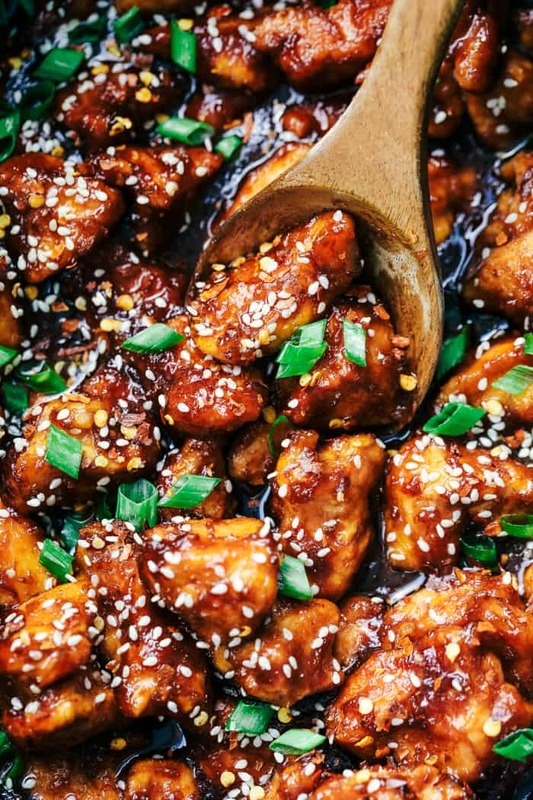 Can this sauce be used in the same way as your baked Chinese chicken recipes? Can this recipe be used on a Keto diet? Holy cow this is so good!! Easy to make!! I am so excited to feed my family dinner! I couldn’t find this on your Instagram to make a post. This was good but the hour i spent sauteing the chicken in batches for crispness was a wasted effort. Any crockpot I have ever used tends to steam as it cooks. That does not result in anything being crisp. If I were to make again I would do stovetop If I wanted crisp. Flavor was great though. This sounds wonderful! I’m adding is to my weekend menu. Only change, I have a thing go pineapple in my spicy Chinese dishes. Think I’ll add a can of minced or diced to the pot at the end. Thanks for the recipe! Made this on the stovetop and it was excellent! How did you make this recipe on the stovetop? How long do you cook on stovetop? I made your beef and broccoli in the crock pot yesterday. We loved it and would make it again. The directions we clear and easy and it tasted great. I made this today for the first time! It was amazing! I used thighs instead of breasts and crisped them in the pan first with the oil and cornstarch. So great! Thank you! Mmm… sounds yummy with thighs. I made it last night with breasts but will try with thighs next time! Color me amazed. This recipe is amazing. It satisfied my guys whose favorite food in the whole world is General’s Chicken. Especially my son who was requiring “comfort” food. It passed every litmus test known to *this* family. My least favorite thing about making Chinese is having to whip everything together last minute. Not so with this! This recipe is a keeper. Exactly as is. I *never* do that. Wow! I’m (also) usually not the type to leave a comment, but I had to thank you for this wonderful recipe! I did not have enough time to place it in the slow cooker, so I instead made it on the stove. I first browned the chicken and then added all the sauce and some water. It cooked for about an hour on low with lid on (really until the sauce became thick and water evaporated). It was amazing! Definitely better than take out. We served it with fried cauliflower rice and green beans! Making again today! I also made this on the stove top. I spent longer browning the chicken to get it more crispy. When the chicken was browned on both sides I simply added the sauce mixture, covered the pot and turned the heat down. I did not add water. I heated the sauce, stirring frequently. I made the rice and 10 minutes later had a delicious meal. I did not have good results with this recipe. Flavors were excellent, but I put is on low ad went to the gym. It was really black when I returned, with no sauce! Needs more liquid to sustain it for 3 hours in slow cooker. I should have realized it but I just went on my merry way and spaced it! If I skip browning the chicken, would you still recommend coating the chicken in cornstarch? Yes! That is a great way to cook this chicken. I had the same experience with this recipe as Renee. I cooked it for 4 hours and it was way too done and dry with no sauce left. I think next time I’ll either cook it on the stove or cook it for way less time and double the sauce. I made it on the stovetop. I just fried the chicken all the way and then added the sauce for about 7 minutes on low- medium heat and it all came together nicely and tasted great. Took an hour from start to finish. Cook the chicken in the pan completely and then mix it in once sauce has had time to simmer for at least 20 minutes. I added fresh ginger root, peeled, and mashed fine, then put into sauce about 1/2 way thru. To the pot I added the ginger about 1 tablespoon, and some molasses, ( about 1/4 cup), to make it a bit tangy. 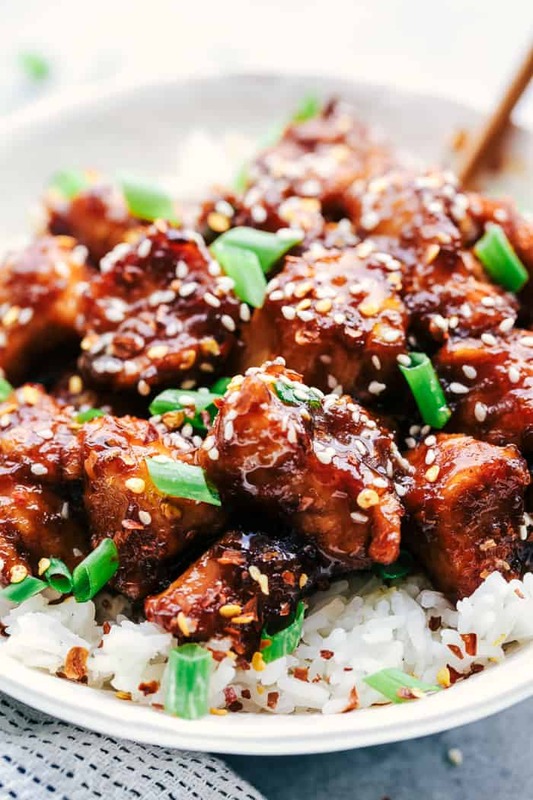 I made a quick and easy variation of this using the pressure cooker setting and no browning step, and it was awesome and tender. Lay boneless/skinless chicken legs (chopped into 2-3 pieces, no corn starch coating) on bottom of IP. Cover in the sauce. Cook on Hi pressure for 10-12mins (Breast would probably be 12mins? ), with natural release. At end the sauce in the pot is quite runny so remove the chicken, put IP on saute to take the sauce to boil, remove 1/4 cup of the sauce and mix with 2Tbs corn starch and then whisk the slurry back into the sauce in the IP for a minute or two. Stir back in the chicken. Was great with cauliflower rice cooked with onion, garlic and a bell pepper. This was really yummy and toddlers loved it too. I wasn’t sure what crushed chilli was so used ground chilli (I’m Australian). Served with coconut rice and Asian broccoli. I only used one chicken breast and half the sauce as wasn’t sure i would like it but definitely making more next time and freezing it. Thanks for sharing! Could I please ask …..Is the Crockpot General Taos recipe…freezable??? AWE! You are SO sweet! Thank you so much for all of your love and support! Yes, this does freeze well. I actually like to freeze the chicken individually on a sheet pan tray in the freezer. Then when it is frozen after an hour or so I will stick them in freezer bags or use my sealer and placed back in the freezer. Hope that helps! Thanks for following along with me! Hello…. This might be a silly question but how much do 4 chicken breast fillets weigh?? I have a tray of them at the moment and they weigh 2kg (4lbs)…. Seems a bit more than I anticipated? It would be nice to know the Nutritional facts. This looks amazing, but my husband is on a very low cholesterol diet, so not sure he could have this. I like to use myfitnesspal.com or skinnytaste.com for any nutritional information. Hope that helps answer any nutritional questions that you have! I made this but I air fried the chicken. SO CRISPY and amazing and the best part is the chicken only took 4 minutes to cook. Then it was right into the pan to caramelize it into the sauce. That is a great idea! Thank you for sharing! I am glad that you made it your own and you loved it!